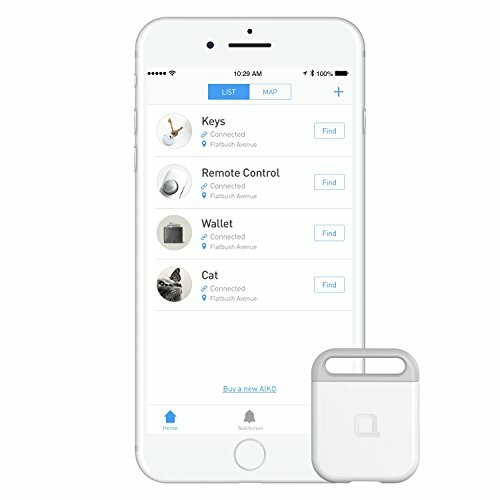 Rechargeable Smart Bluetooth Tracker you can use as key finder, wallet finder, phone finder, pet finder, etc. Download and install easy to use iOS/Android AIKO App. iOS 8.0 or newer and Android 4.3 or newer is required. Computer hardware for tracking the location of wireless transmitters and receivers; Wireless controllers to monitor and control the functioning of other electronic devices. [Easy Setup & Intuitive App] Set up within 1 min. Free iOS App with video tutorials. [Find Lost Items & Find Phone] Tap 'Find' on App to make AIKO beep. Double press AIKO device to make your phone ring. [Last Known Location & Community Search] Use 'Community Search' to leverage nonda users' help to find your lost item. [What Included] An AIKO device, a micro USB cable, a user manual, one-year warranty, efficient customer service (2017 The Stevie Awards Winner).